Happy Spring Release Month Coiled Followers! -April is Autism Awareness month. Check out what you can do to help the cause at Coiled Wine Bar downtown! Read ahead. 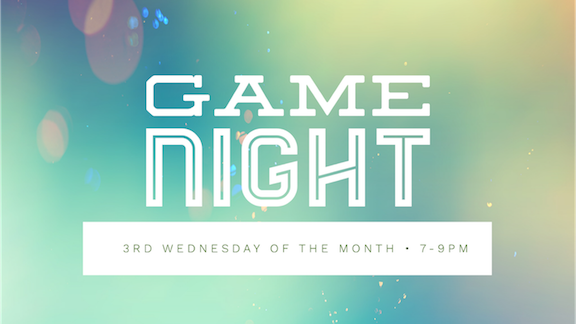 -In addition to Bingo downtown on the 2nd and 4th Wednesdays, we will be adding a new event on the 3rd Wednesday: Coiled Board Game Night! We will have a litter of games available, or you are welcome to bring your own. -The new Translations RED Cab blend in BOTTLE is available to all! If you haven't tried this fun red, get in and do so! -Angel Food will be back downtown on the 14th! Come check them out from 7-9 pm. Free entrance. -Thank you all for nominating Coiled Boise Weekly's "Best Winery"! We are thrilled to be listed among our 4 fellow nominees! Please continue to VOTE FOR COILED for Boise Weekly's "Best of Boise" when they open up the ballot April 11th-30th. -Please make sure and read ahead for even more details on all of our April events! -We have our new 2017 Dry Riesling, 2016 Sidewinder, and 2016 Black Mamba in house and available for Club to taste and purchase by the glass and bottle. You are welcome to come by either location to pick up your allotment during open hours, as you were all charged on the 1st. As a reminder, you are welcome to exchange, add to, or modify your orders when you come to pick up your wine! -For those that have incorrect card information, did you know you can login and update your credit card, check your pending transactions, edit your orders, and all online!?!? Visit CoiledWines.com and visit the club portal. -Club members, if you were unable to get seats to our "Sixth Sense" release event on the 22nd, please contact info@coiledwines.com. We will do our best to accommodate everyone! Excited to see you all for the spring release! If you were unable to snag a seat before we sold out, please contact info@coiledwines.com. We will do our best to accommodate everyone! April is Block Party BINGO! COME TO THE WINE BAR TO CLAIM YOUR PRIZE! 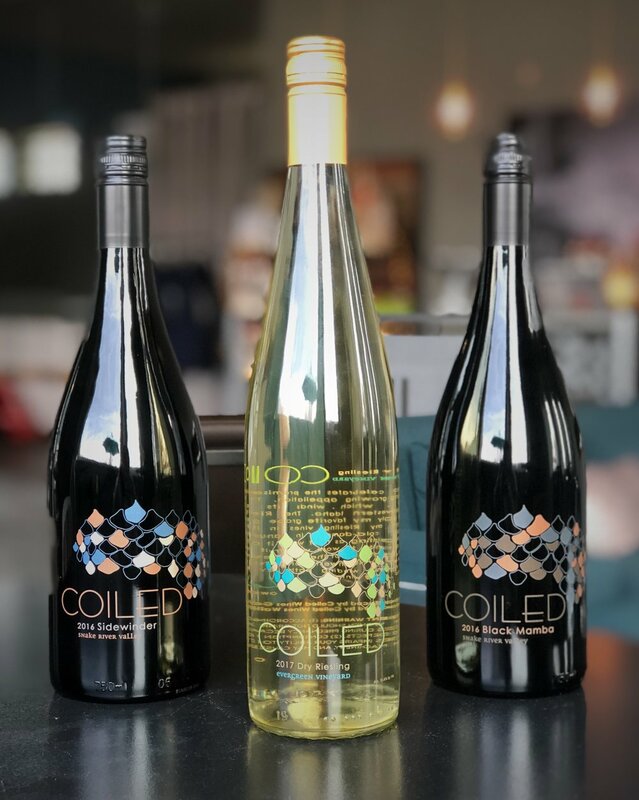 Coiled Wines made the top 5 nominations for "Best of Boise 2018"! This is our shameless request for you to Vote us the best! Cheers to our fellow nominees! Mel's daughter is super active in this month and cause. She has spent time making Autism Acceptance Ribbon keychains. We will be selling these at the Wine Bar. All profits will benefit Boise Autism Society. How is it already April? I am thrilled to see Spring, but I don’t know where the time goes. This is a fun time of year for me. Wine is in bottle and I look forward to sharing it with all of you. Kelly is pulling her hair out with event logistics, but I am pretty chill. It is good that we don’t go through chaos at the same time anymore. This alternation allows us to bolster each other during our respective grinds— giving each other knowing nods (this too shall pass), big hugs, and taking a lot of deep breaths. Ross, the kids, and I recently visited friends and family in California. It was such a treat to see everyone and a reminder that strong ties never break. Napa has changed so much since we left! It is absolutely gorgeous, but it definitely feels more and more like a tourist destination. Fortunately, I saw no signs of fire damage while I was there and the community seems to be back to normal. Now that I am home and bottling is over, I can fully focus on upcoming events and on improving our patio at the winery. We will be putting up a shade cover over the entire patio, so people and plants can enjoy the outdoors even on the hottest of days. This project will take some time, but I plan to have it fully in place by June 1. 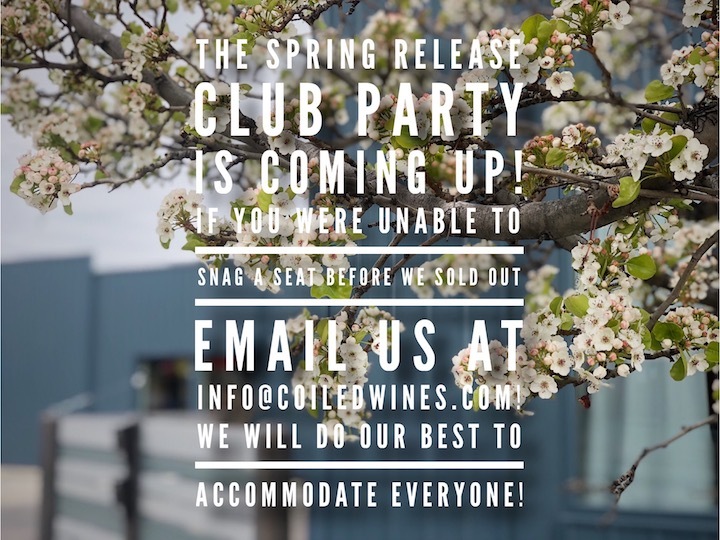 Our biggest event this spring is the wine club release party on April 22nd. I always really look forward to these events, and this one in no exception. We change it up every time so it is fun for us to plan and fun for you to attend. This time I am not doing any formal presentation. Instead, I get to float around and chat with our beloved club members. Other people will have the pleasure of presenting and entertaining you, and there just might a few fun surprises in store. This will be our first release of the Coiled line-up in our own space. As the day of the event approaches, my current chill-mode will be replaced with nervous fidgets. It is just part of the deal. I love the wines. I am not hurt if you prefer other vintages. So why the nerves? It is just a level of vulnerability that comes with putting yourself out there, hence the quote I cited at the top of my letter. I recently saw a TED talk by Brene Brown on vulnerability and how essential it is to leading a rich, honest, and productive life. This prompted me to read several of Brown’s books including Braving the Wilderness: The Quest for True Belongingand the Courage to Stand Alone. In Wilderness, Brown discusses how deeply divided we have become as a country. She argues that to belong anywhere, you have to have a true sense of belonging within yourself. She counters this to fitting in, which is more about conforming to the norms and expectations of a specific group of people. Brown suggests that it often takes some unsettling time in the “wilderness,” stepping outside of the comfort of our self-proclaimed categories, to truly learn to belong and be comfortable. Insisting that we are hardwired to belong, Brown also provides evidence revealing that despite all of the digital connectedness we have, we have never felt more alone. I bring all of this up because I think it explains a lot of the joy that I find in Coiled and I think it explains why some of you feel so at home here. Coiled epitomizes my sense of belonging, as opposed to fitting in. The traditional path from U.C. Davis to The Napa Valley did not fit me and it took years in winemaking “wilderness” to figure out what would. Making wine from Idaho grapes, while living in the Napa Valley certainly felt wild, but look where we ended up! We are now in a space where we belong in every sense. When I brought up Idaho in California, everyone confused it with Iowa and Ohio. Don’t even ask me about some of the responses I got when I started asking you to drink Riesling. Kelly and I have spent years trying to grow Coiled in a way that reflects our professional and social ideals, while also allowing us somesanity as working moms. Ross and I have spent years molding Coiled so it fits in with our priorities as a family. Each person on my staff brings a very unique voice and skill-set to the mix and has helped us take Coiled to the next level. All of you bring your fun stories and comments (“Rizza is my spirit animal”), genuine love, and support. Together, we have created a space where we can all feel a sense of belonging. There is no mold for that. May April showers bring bright flowers!